Nowadays WordPress themes include too many features and tools to create any kind of website you need and our WoodMart theme is not an exception. There are a lot of functions and elements for eCommerce, blogging, portfolio, retail, multi vendors etc. The theme has CSS styles to support 15+ additional plugins and extensions. And it is natural that a regular website will not include them all but their styles will be always loaded and it harms your website performance and user experience. To solve this problem we developed a new tool to improve your website performance by reducing a number of loaded styles on your website. Now, you can easily choose what options and plugins you will use and generate a specific CSS file that may be reduced by 20-50% from the original one. 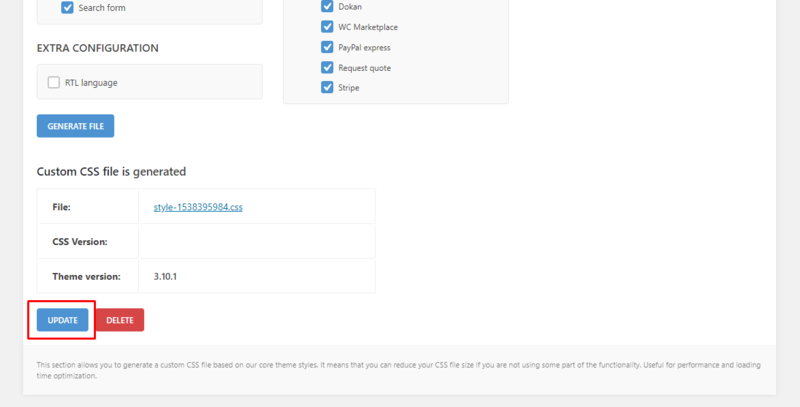 To use this option you need to update the theme to the latest version and then go to Dashboard -> WoodMart -> CSS generator. Walk through all the existing options and leave only that features and plugins that your website will use. Then click on “Generate file” button and wait till the file will be generated. Some servers may have closed files system and you will be prompted to enter your FTP credentials. If you will have any problems with this or the file will not be generated completely, please, create a topic on our support forum and send us your admin and FTP access so we can check what is wrong. NOTE: This file is not automatically updated when you update the theme. 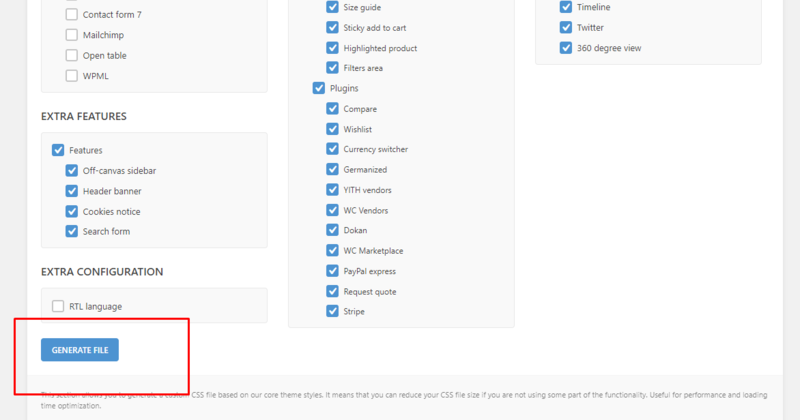 So, after each update, you just need to go to CSS Generator interface and click on the “Update” button to actualize all the styles with from the latest theme update that corresponds to your configuration.